Pasta sauces are savory toppings and mixtures of ingredients that enhance the overall taste, texture, flavor, and aroma of pasta. Pasta sauce is available in several varieties such as marinara, alfredo, and pesto, and made of different ingredients like tomatoes, basil, cheese, and others. Pasta is one of the most loved Italian cuisines, and is gaining worldwide recognition. The increasing demand for pasta is directly surging the consumption of pasta sauce. In the global pasta sauce market, the demand for pasta sauce is increasing owing to its palatability and lip-smacking taste. In the past few decades, pasta sauce products have been evolving with the increasing demand and trends in the market, such as, pasta sauces are available as organic, gluten-free, and include non-GMO ingredients. Increased penetration of pasta sauce producers in developing economies has made the pasta sauce market more competitive with frequent and innovative product launches, more convenient delivery of products, and high quality certified products. In the global pasta sauce market, players are following aggressive acquisition strategies for their global expansion and to increase their customer base. Leading companies in the pasta sauce market such as Mizkan America Inc. and Barilla S.p.a have acquired many companies that are operating in the pasta sauce market. Acquisitions have helped them profit due to the existing brand image in the regional markets. Manufacturers involved in the pasta sauce market are also focusing on incorporating cutting edge technologies in their production lines to enhance quality, efficiency, and production capacity. The pasta sauce market is following the customer-centric approach, and focusing on the current trends and demands of customers, leading to the updating of pasta sauce products in the market. Pasta is among the most favorite and widely consumed Italian food product consumed throughout the world, and as such, pasta sauce is also widely consumed. Due to the increasing popularity of pasta sauce, a majority of the manufacturers involved in the production of pasta are emphasizing on bringing pasta sauce into their product lines. In the global pasta market, the availability of a different types of pasta is also influencing the pasta sauce market, such as the specificity of the pasta sauce in accordance with the type of pasta. The highest per capita consumption of pasta is in European countries, and on the basis of data from the International Pasta Association, Italy tops the per capita consumption of pasta. In Italy, the per capita consumption of pasta is 25.4 kg per person, followed by Tunisia, Venezuela, U.S., and others. Pasta is one of the most preferred food products by consumers throughout the world. The global pasta sauce market has witnessed flourishing growth in the past few decades. With the increasing popularity of pasta, the global pasta sauce market is set to witness an impressive growth during the forecast period. In the global food and beverage market, customers are getting attracted towards lip-smacking food products. In addition, flavor inspiration is also influencing the food and beverage market, as people explore more of the world through the palatability of their cuisines. In the pasta sauce market, flavor inspiration is one of the major factors resulting in the booming demand of pasta sauce among customers. Pasta sauce is made with a variety of food ingredients that impart their taste, aroma, and texture to the pasta sauce. Due to the wide availability of different, pasta sauce is popping up in grocery store aisles as the most preferred go-to cooking sauce. Automation continues to impact sector growth, and key players are already pumping in investments in newer technologies, product offerings, and operational models with a sustained focus on providing rich customer experiences through robust after-sales services. An increasing consumer thrust on health, wellness, safety, and sustainability has led to a rise in the deployment of advanced sensors and robotics in pasta sauce processing and packaging. Technologies such as RFID are being considered to ensure product traceability and further monitor critical in-transit components, including pressure, temperature, and humidity. Automation also drives advances in pasta sauce safety with sensor technology and robotics to minimize human contact, thereby ensuring the near 100% contamination-free processing and packaging of pasta sauce. In the food and beverage industry, transparency and trust have become major challenges, as there aren't any strict guidelines and regulations laid down by governments regarding clean labeling. Companies have started using clean labeling as a buzzword for marketing and promotional purposes, and have taken advantage of this to sell their products as clean label products. It is essential for pasta sauce manufacturers to adopt cleaner practices to sell their clean label pasta sauce products without alienating the trust of consumers. The proposed market report of TMR on the global pasta sauce market evaluates the opportunities in the current market, and provides updates and insights corresponding to different segments involved in the global pasta sauce market over the forecast period 2018-2028. The global pasta sauce market report further exhibits the estimated data for 2018, and forecast data up to 2028 in terms of value (US$ Mn) and volume (MT). In terms of value, the pasta sauce market is anticipated to increase at a CAGR of 6.5% during the forecast period. 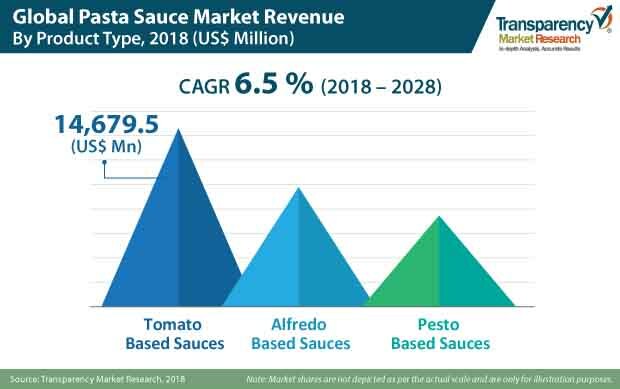 The present study exhibits the trends and market dynamics of the pasta sauce market in five major regions - North America, Latin America, Europe, Asia Pacific, and the Middle East and Africa. The report also includes the study of the current issues with consumers, and various future opportunities for the pasta sauce market. The report explores the global pasta sauce market for the period 2018–2028. The primary objective of the report is to provide insights into the key developments in the market that are consistently supporting the transformation of global businesses that are associated with pasta sauce. It is very important to consider that, in an ever-wavering economy, we provide the estimated (Y-o-Y) year-on-year growth rate in addition to the Compound Annual Growth Rate (CAGR) for the overall forecast, to better understand the analysis and evaluation of the global pasta sauce market, and to discover equitable opportunities. Yet another key feature of this report is that, the estimation of the global pasta sauce market and the corresponding revenue forecast is carried out in terms of absolute dollar opportunity. This is usually not prioritized while forecasting overall market numbers. Absolute dollar opportunity analysis is very essential in evaluating the degree of opportunity that a provider can observe to execute, as well as to contrast the potential resources from a sales perspective in the global pasta sauce market. The report starts with an elaborate executive summary, the market definition of various segmentations that are included, and their respective shares in the global pasta sauce market. The report further incorporates the major macroeconomic factors that have an effect on the growth of the pasta sauce market. The report also highlights various market dynamics, which includes the drivers, restraints, opportunities, and trends in the global pasta sauce market. The report further underlines the study of the present issues with industrial processing and opportunities for the pasta sauce market. It also encompasses a value chain analysis that provides a structural view of overall profitability from the manufacturers to the end users in the pasta sauce market. It also comprises detailed information about the recent technologies that are used in the manufacturing processes of pasta sauce. In order to provide users with a clear view of the global pasta sauce market, we have exhibited a competitive analysis of key market players and their strategic expansions. The competitive dashboard presents a detailed comparison of pasta sauce manufacturers on valuable parameters such as key product offerings, total revenue, key developments, and key strategies. The study intensifies the global pasta sauce market attractiveness analysis by product type, nature, packaging type, distribution channel, and region. To evaluate the overall market size of pasta sauce, the report considers various fundamental aspects based on secondary research. Furthermore, it emphasizes quantitative evaluation, such as market shares by product type, nature, packaging type, distribution channel, region, and other qualitative data from primary respondents, which have been consolidated to arrive at clear and accurate market estimations. The forecast presented in the pasta sauce market report arrives at the total revenue being generated, and the expected revenue contribution in the future by the global pasta sauce market. Detailed profiles of companies that manufacture pasta sauces are included in the report to analyze their developmental strategies, key product offerings, and recent developments, as they have a significant role in the global pasta sauce market. Major market players covered in the pasta sauce market report are Mizkan Co., Barilla S.p.A., Dolmio (Mars Inc.), Hunts (ConAgra Foods, Inc.), The H. J. Heinz Company, Newman Own Co., B&G Foods Holdings Corp., CSC Brand LP, Premier Foods plc., Lassonde Specialties Inc., Giovanni Food Company, Inc., Pellicanos Specialty Foods, Vino De Milo, Delgrosso Foods Inc., Nature’s Sun Grown Foods, Inc., Monterey Gourmet Foods, Dave’s Gourmet Inc., Nellino’s Sauce Co., and others.